My old apartment was half a mile from the Hollywood/Western station. My new house is over one and a half miles from the Vermont/Beverly station. Too far to walk for a typical commute, but I will not be unfazed. For my commute to Culver City, I have my husband drive me to the station, or I take a Metro Rapid bus down Western avenue to connect with the Expo Line. The Vermont/Beverly station is landscaped with drought-resistant desert plants along a walkway that runs behind the escalators that descend to the subway. It’s got steps and levels and foot traffic flows easily through. Vermont/Beverly entrance 2013. The landscaping is very close to the artist rendering above. 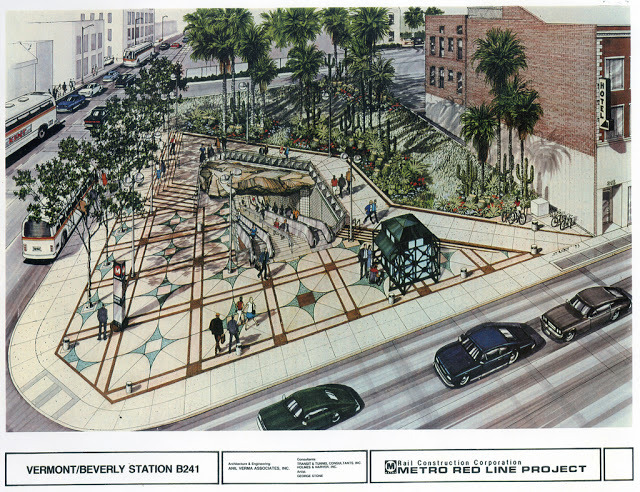 1993 artist’s rendering depicting the entrance of the Red Line station at Hollywood and Western. Comparing the artist’s renderings for Hollywood/Western to how it turned out, it is hard to imagine how things went so wrong. Tiles and stone beneath a terribly dated low-income housing project. 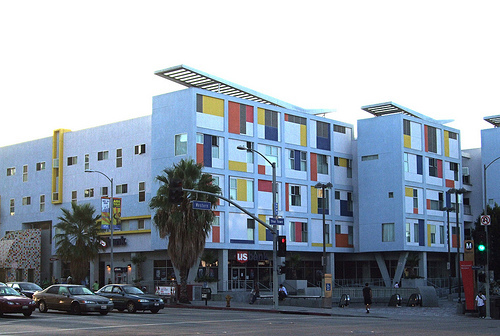 Despite the attempt at color and design, the corner is bleak as compared to the life (as in, plants, actual, breathing life) at Vermont/Beverly. Of course, the artist’s rendering shows no housing unit, which is a necessity for the area, but how on earth did the actual development turn out to be so, so ugly? Back to the bus, Metro Rapid 757 stops at the south-west corner of Melrose and Western, in front of a gas station. It is not a pretty corner. It is trash littered and hot. The bus is always crowded, standing room only, but it’s a core-strengthening, balance-challenging kind of standing. I can count it as part of my exercise routine. Nearly five years ago, when I used to take the train downtown to my job at The Unusual Suspects Theatre Company on Olive Street, I was often the only business-class person on the train, and it was never crowded. The majority of riders were families (lots of non-car-owning moms with their babies) or workers of the non-office sort, judging by apparel. No suits and ties, I mean. Sprinkled lightly within the crowd would be one or two FIDM students in their artsy, stylist get-ups. 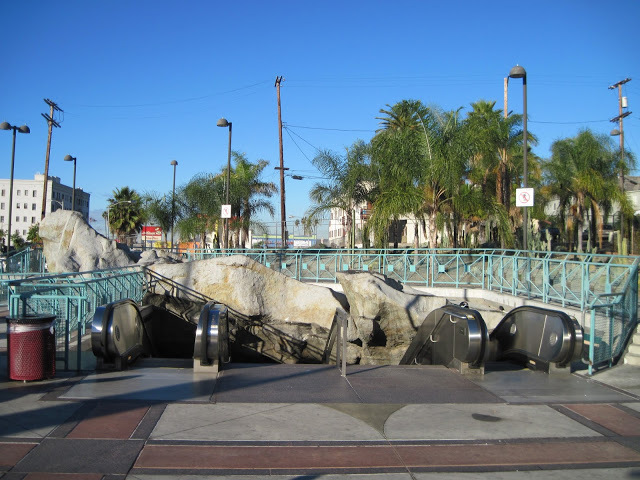 Today, the ridership has greatly increased, and there are often no available seats on the red line (the expo line is still gaining riders, and finding a seat is never a problem). The most marked difference between now and five years ago are the number of suits on the train. Professionals are commuting downtown by Metro. Gas prices have driven people out of their cars and onto their feet, and has also driven them into neighborhoods near metro stations. This shift was fairly predictable. After a few decades of people wanting space and isolation as well as city salaries, rising gas prices and recessions turned their desires from the suburbs to city centers – where to get groceries or go to the movies or get drinks with a friend, all you have to do is walk out your front door. The Metro Rapid ridership is still comprised of the demographic on the train five years ago. I don’t know why the business class isn’t on the bus. I wonder if it’s because the street atmosphere of my particular nook of East Hollywood (Western Avenue) just isn’t pretty. 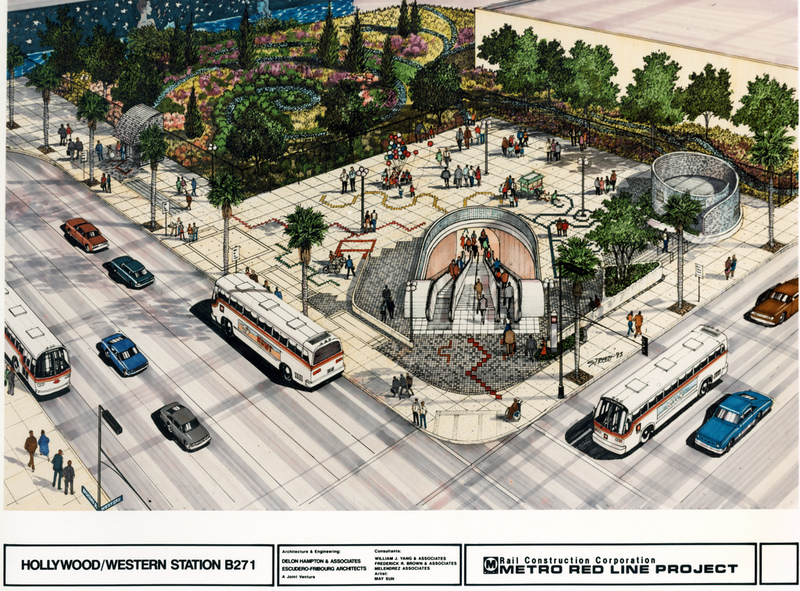 Urban design and aesthetics go a long way to get people of all sorts onto transit – those who need it because they don’t have a car, as well as those who have the privilege to choose to not get in their cars. Maybe it’s the jostling. A crowded bus does cause a person to jostle, especially when it’s charging down Western Avenue. I know I write about public transit a lot. That’s because I’m on it a lot. And I’m on it a lot because it’s a far better way to get around a city, to plan a city, to design a city, than by car.